This morning I was thinking it’s going to be chilly and kind of crappy out, but I was wrong. It was sunny and warm. Perfect for shopping the Farmer’s Market. When I got there, the place was packed. Now normally I would moan and groan with so many people being around, but I have to say it was nice. Everyone was happy, kids were handing out samples (love samples), lots of fresh fruits and vegetables and the smell of that dam Kettle Corn. I swear if there wasn’t a line of people I would of bought some. Darn Kettle Corn! Here’s what I got! Now I should be stocked up on Strawberries now. I also got some fat cherries, nectarines, yellow peaches, asparagus, apricots and I think either a zucchini or cucumber. Not sure what that is, but either way I’ll eat it!! I didn’t do to bad, I spent $23.00 for all these goodies. After the Farmers Market I went to Trader Joe’s and spent a little more. Here’s what I got, oh and there are some new items hidden in there. Can you find them? I broke down and bought my Battered Halibut. Last week, they weren’t in stock. They cost $9.99 a box. It’s a treat because normally I wouldn’t spend that on battered fish. Last week I updated my Trader Joe’s page, I put on there Jumbo Beef Hot Dogs and categorized them under Husbands favorite. He didn’t try them when I posted it there, but he did this past week. I wasn’t sure what he thought. So today at TJ’s, I called him and asked him, do you want me to pick you up anything? He normally says no, I’m good. But today he said yah, more of those hot dogs, there good! And I want pepperoni and the Bacon Ranch Dip. I was kind of shocked, that he wanted me to pick him stuff up. Now as you can tell from his list of goodies he wanted, there not healthy! But I’m happy to know the hot dogs have no nitrates and they are 100% beef. Not sure how the stats read on the Bacon Ranch and the Pepperoni, but it doesn’t matter, I just want to make him happy!! Today’s bill cost $131.00 I don’t think it’s to bad since I bought chicken, pork tenderloin, battered fish and his $4.99 hot dogs. Oh the new items, here they are. 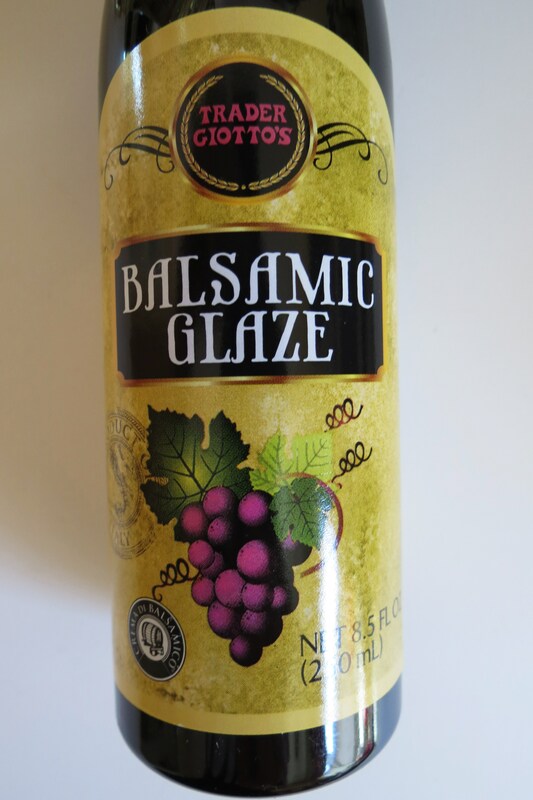 I am excited to try the Balsamic Glaze. 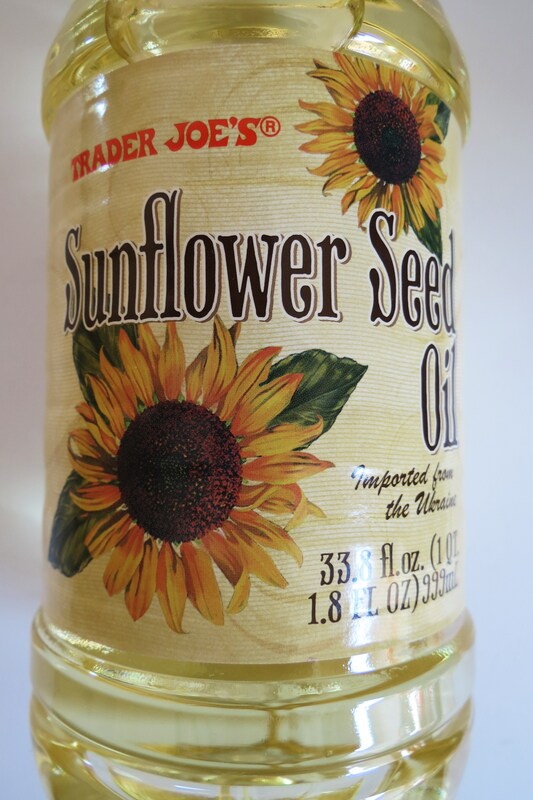 I have a bunch of different ideas on how to use it, so next time you go to Trader Joe’s pick up a bottle. However, I haven’t tasted it yet, so maybe I won’t like it? Doubt it, I love balsamic anything, so this will be good. Have you seen it yet? Did you try it? 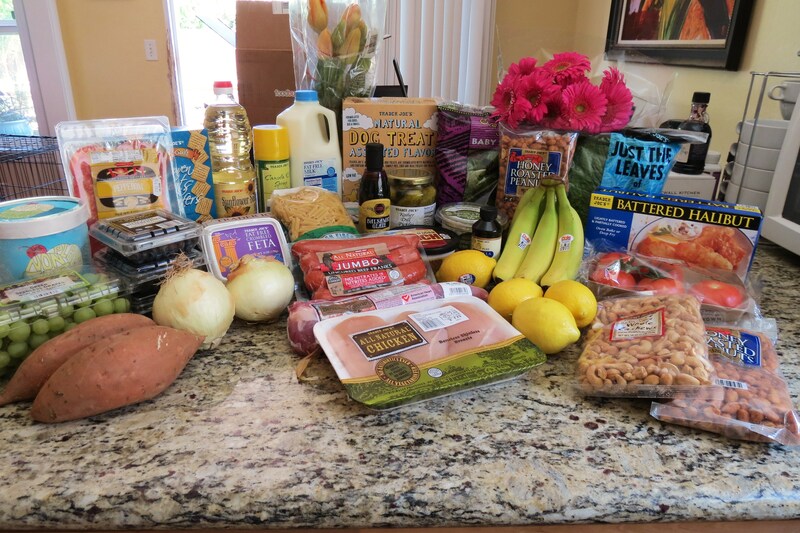 After my grocery shopping trip, I decided to do shopping for me! I went a little bonkers! I bought some shorts, tank tops, a dress and I think thats it. I am such a sucker when they sales associates tells me, that looks so good on you. Ok, I’ll take it!! I spent more than I planned, but I got a lot of wonderful pieces. I’d show you a picture of all my buys, but I know my Husband would fall over and I’d get yelled at, so I’ll keep it to myself. 🙂 Shhhhh! 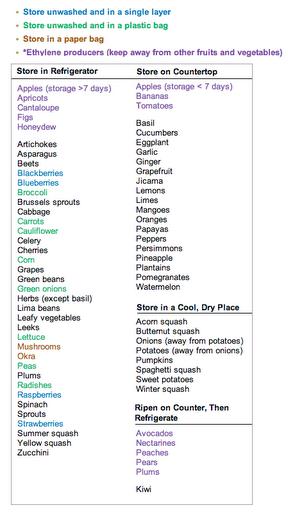 Since I have gone to the Farmer’s Market I thought I would share with you how to store fruits and vegetables. I find this list so handy that I keep it on my fridge for reference. I think you will find it helpful too!! I got this from Sparks People. 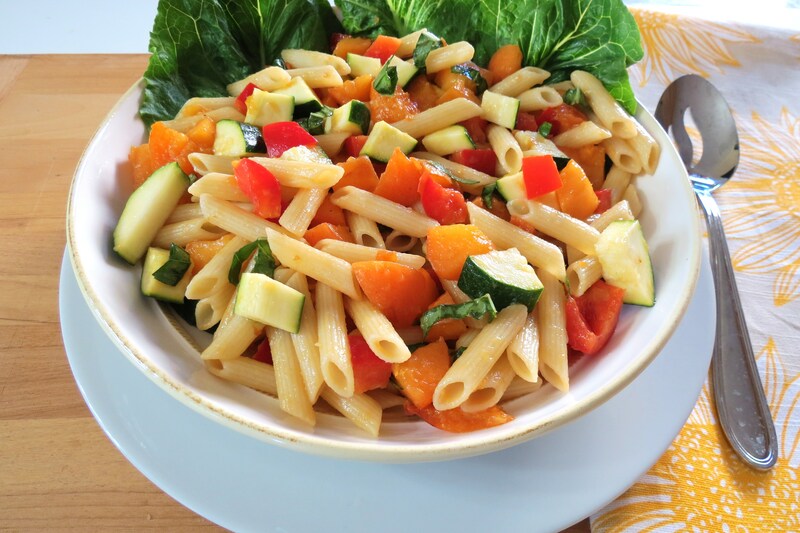 Now time for me to tell you about today’s healthy Apricot Pasta Salad. I got this recipe from the Farmer’s Market. 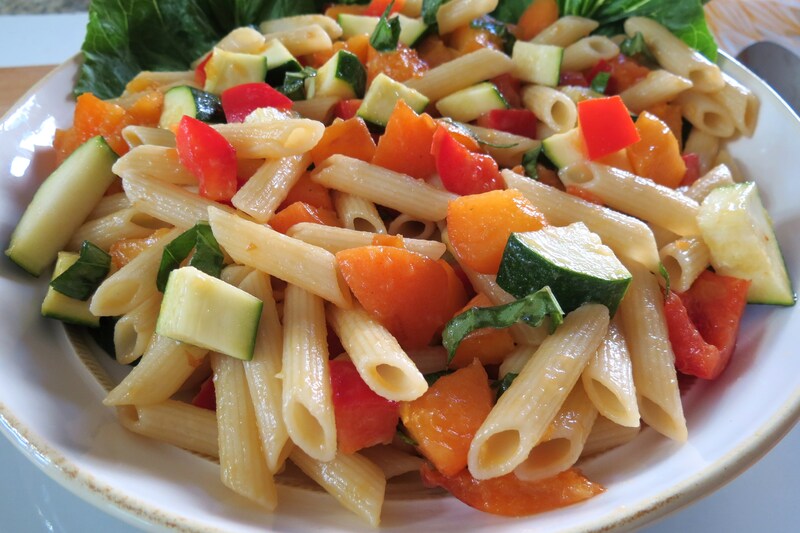 It’s made with only 4 oz of Trader Joe’s High Fiber Pasta, zucchini, apricots, sweet red pepper and basil. Than I made an apricot basil dressing to go over the top. It tasted so fresh with sweet and savory flavor. It’s a perfect salad for this time of year. I thought it would be a different spin to regular pasta salad. I have never had a salad like this before and boy was I missing out. However, my Hubby didn’t like it. If it’s not drowning in mayonnaise, he won’t eat it. Thats fine by me, all the more for me to have!! Today I was going to post a different recipe, but I thought you may want to share this for the holiday weekend. If you have apricot fans, than this will be a sure hit. I’ve been staring at the recipe on my counter for about a month and every time I went to make it, I’d find my apricots were gone. My Hubby kept eating them! I even had them hidden in the fridge and he still found them! I didn’t even think he liked apricots, but I guess he does. I just don’t get why he didn’t like the salad. But honestly, he doesn’t like trying new foods. He needs to open his mind man, and try new things. If I didn’t give foods I thought were yucky a try again and again, I would never of learned I loved sweet potatoes, brussels sprouts, black beans, avocados and salmon. Since I started blogging I really have enjoyed trying new foods. I think it’s fun!! The only thing I still do not like are beets and mushrooms. I’ve tried, but I just can’t do it. Blah!! 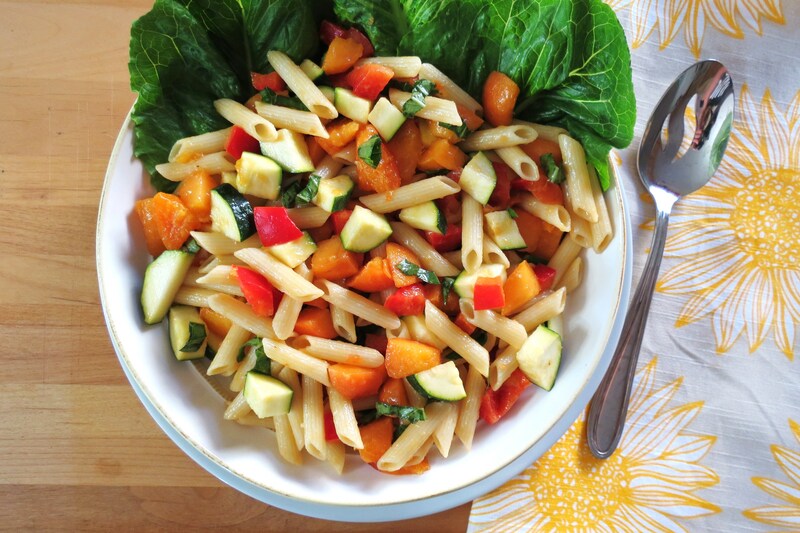 A sweet and savory summertime pasta salad. 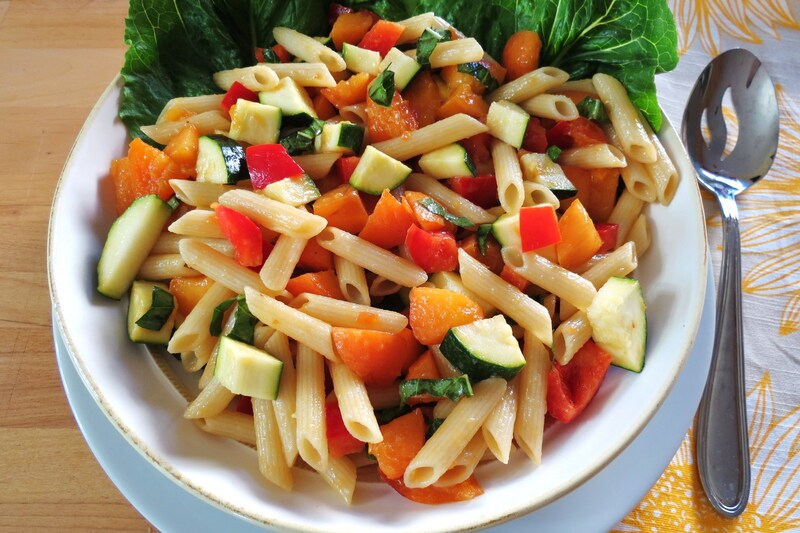 Made with fresh apricots, zucchini, sweet bell pepper and basil, than drizzled with an apricot basil dressing. 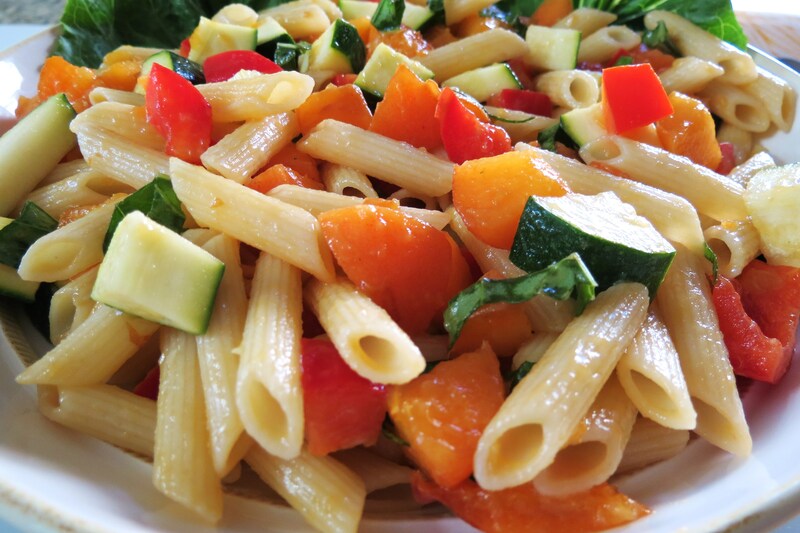 Cook pasta according to package directions, rinse in cold water, drain and let cook. 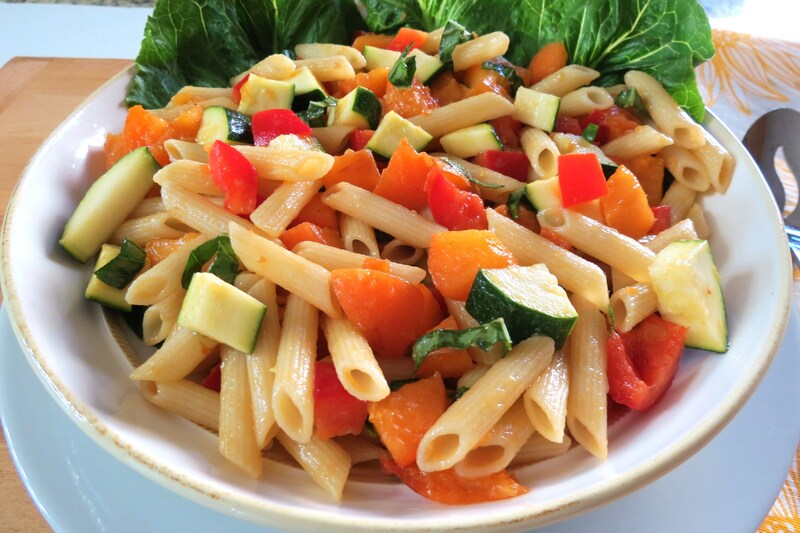 Combine pasta, apricots, zucchini, red pepper and basil in a bowl. Toss with Apricot Basil Dressing Salad and serve on salad greens, if desired. Combine apricot, vinegar and sugar in a blender and whirl until blended. With blender running , slowly add oil until thick and smooth. Stir in basil. 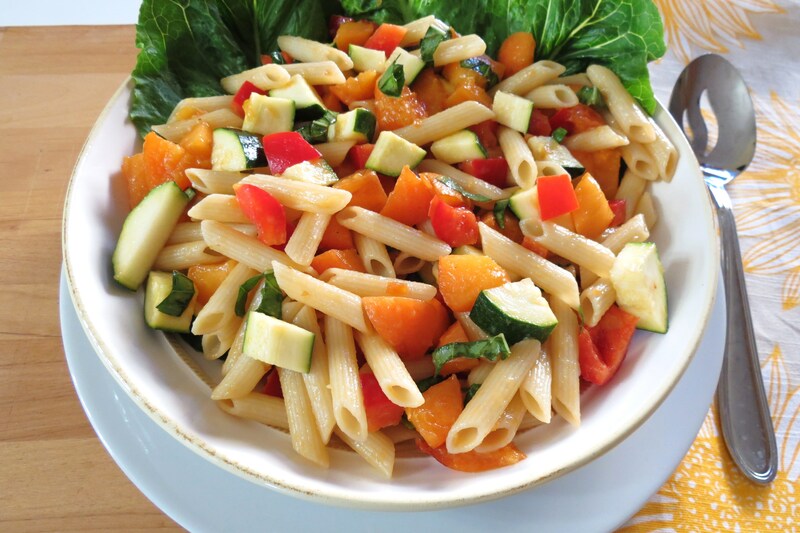 Serve over pasta salad. I thought I would share with you our dessert tonight. 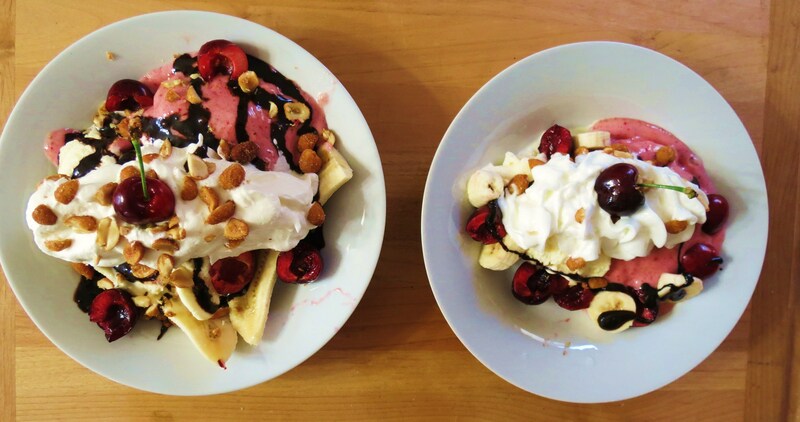 It is the his and hers banana split, my healthy version! 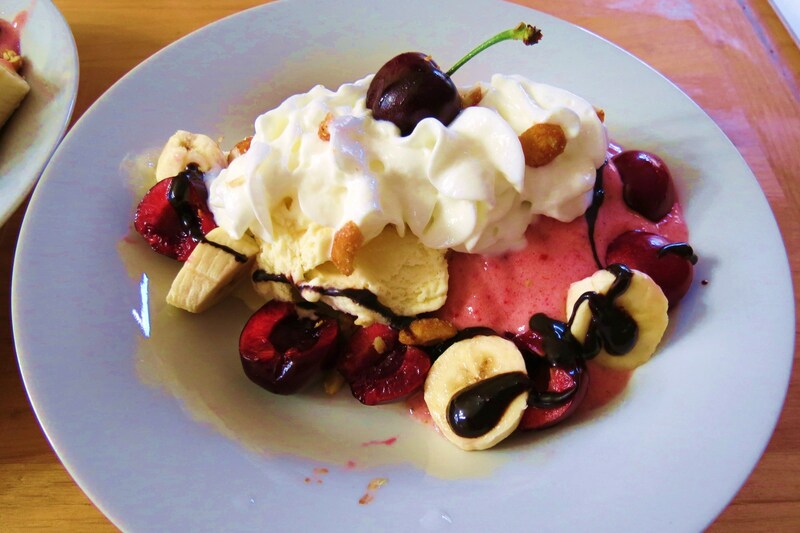 I made his with Fat Free COOL Whip, half a banana, 1 cup vanilla ice cream, strawberry banana soft serve, fresh cherries, lots of chocolate sauce, honey roasted peanuts and love! Not to shabby for a Banana Split! We held off on the pineapple, because he didn’t want any on his and I didn’t feel like cutting one up! 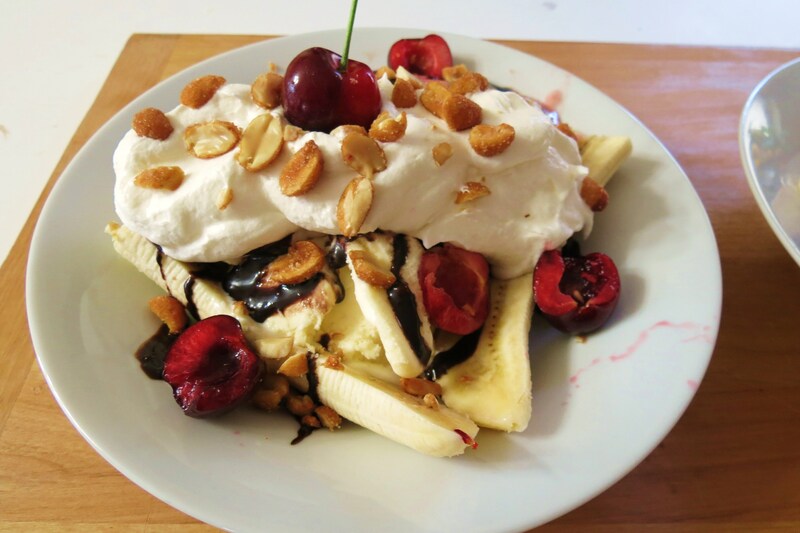 I am going to get a banana boat dish so I can make this pretty. I kind of rushed making it and the vanilla ice cream was hard and my soft serve was melting. So next time this dish will look pretty for you! Did you know calories in a Baskin Robbins Banana Split is 1010, Fat: 34, Cholesterol: 115, Sodium: 240, Carbs: 173, Fiber: 8, Sugar: 125, Protein: 12. Eck!!!! Thank you, I’ll stick to mine. Even Hubby’s wasn’t that bad, my guess about 400 calories, if that! Oh, here’s mine! Ok, I spent hours writing today’s blog and I know most people just skim through to look at the pictures, so I’m going to let you go! I have computer work to do and I don’t want to!! Thanks for the tips on storing things from the farmer’s market! My lettuce keeps going bad from my CSA so I’ll try placing them in a bag now! Your welcome! I find the chart comes in handy. 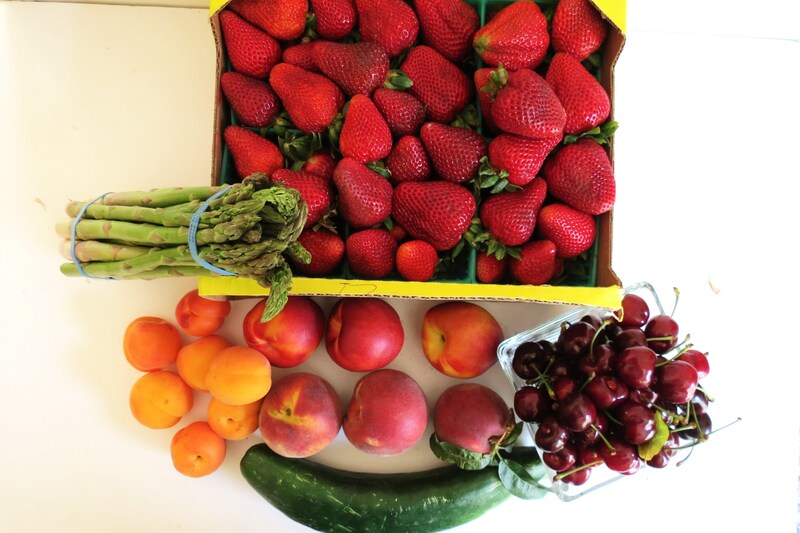 I tend to forget on how to store certain fruits & vegetables! Have a great day!! This salad is so beautiful, great photos! I still am not a fan of mushrooms either, despite all the new things I’m willing to try…at least I’m at the point I can eat them, but I don’t think they’ll ever be a favourite! Your shopping spree sounds so fun, I definitely need to do that and stock up my summer wardrobe 🙂 Enjoy your extra day off!! I put my fruit like peaches,plums, nectarines,ect. in separate paper bags for a few days.Then they’re ripe enough to eat. Yum! Now I have a watermelon in the refrig. to eat. Double yum! Enjoy your days off and keep on making funny posts! Great tips… I love the salad… so full of colour and freshness. Trader Joe’s and the farmer’s market sounds like a perfect morning to me 🙂 Love this pasta salad! I’ve never added fruit to one before, but it sounds delicious! Enjoy your extra day of weekend! Fruit in pasta isn’t to bad, I enjoyed it! Very refreshing! I bet strawberries would be good too!